Much of what I know about setting a table, I learned from years of designing sportswear collections in the fashion industry. I approach a table as I would approach a line, beginning with a concept and then moving first and foremost to color and pattern. 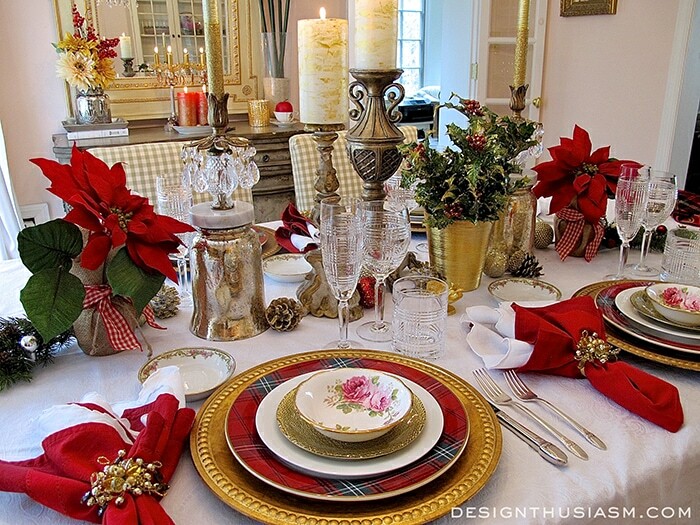 So for this Christmas dinner table, the defining idea was the playful interplay of tartan and roses. 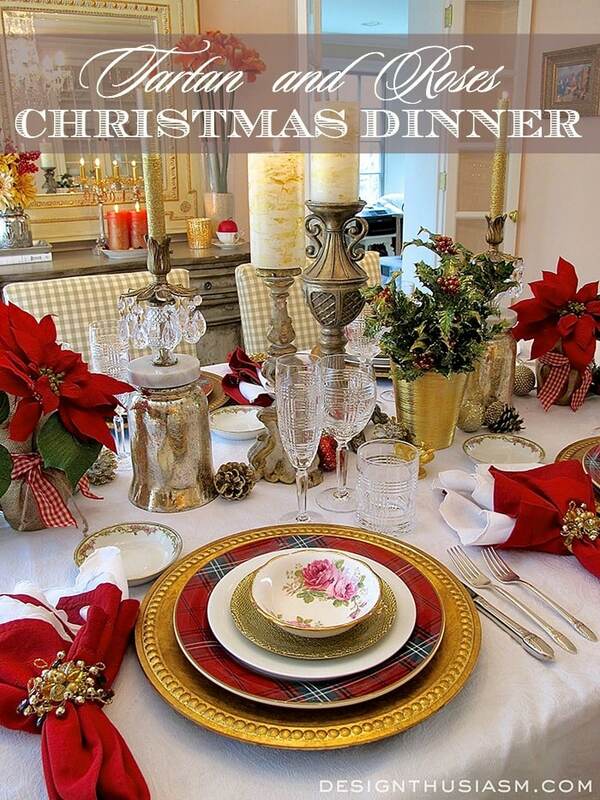 The plate stack in this setting begins with gilded chargers from Pottery Barn and is then is dominated by tartan dinner plates from Williams Sonoma. The crisp white salad plates are from Crate & Barrel, as are the glimmery gold appetizer plates. Topping the stack for a touch of pedigree are lovely vintage dessert bowls in the American Beauty pattern from Royal Albert. Once the key patterns are established, I build back into a setting with decorative items that complement the decor. This tablescape relies heavily on berry red and holly green with a healthy dose of burnished gold, so these festive greens work perfectly with the look. The linen base is a white paisley damask tablecloth from Ralph Lauren Home, while the napkins pair a white embroidered underpinning with a regal red outer layer from Pier 1. The beaded cluster napkin rings are the icing on the cake. 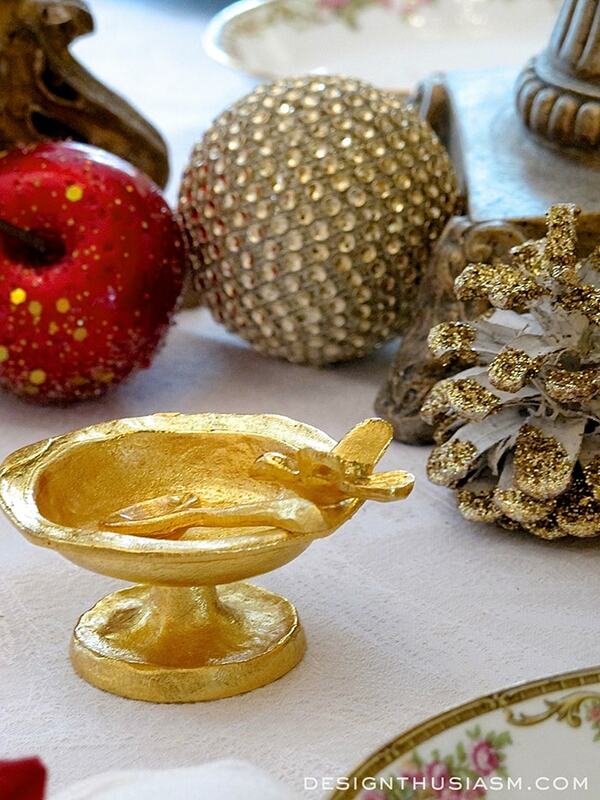 Other decorative objects on the table include this gorgeous salt cellar from Michael Aram, surrounded by scattered ornaments and glittered pine cones. The marriage of the two key patterns are what gives this table its character. The same floral pattern was used in my Christmas morning breakfast, yet when used with other delicate florals it had a completely different pastoral feeling. Here I was going for a more formal tone which the boldness of the plaid offers. Yet the tiny bit of floral lends just enough softening and elegance to avoid a pedestrian effect. 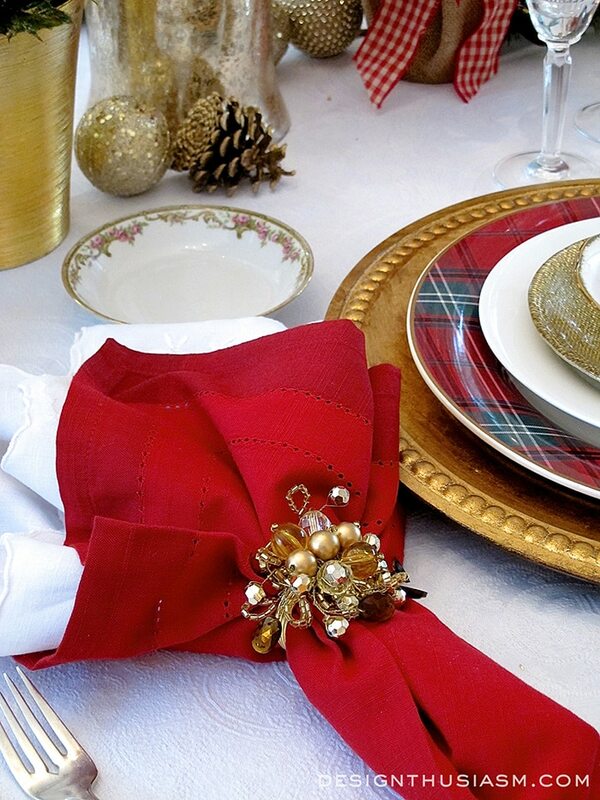 After fabrics and patterns are selected, every table setting needs a bit of “jewelry”. 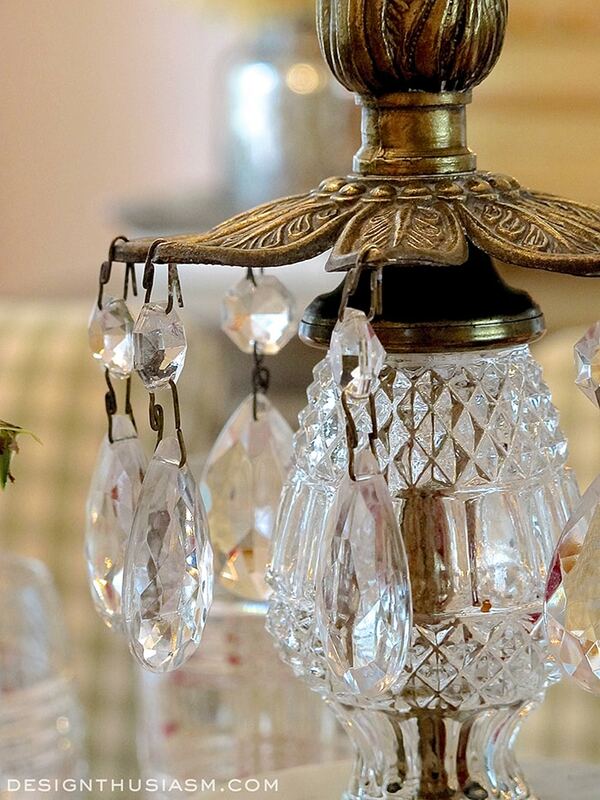 These vintage brass and crystal candlestick holders add just the right touch of adornment. 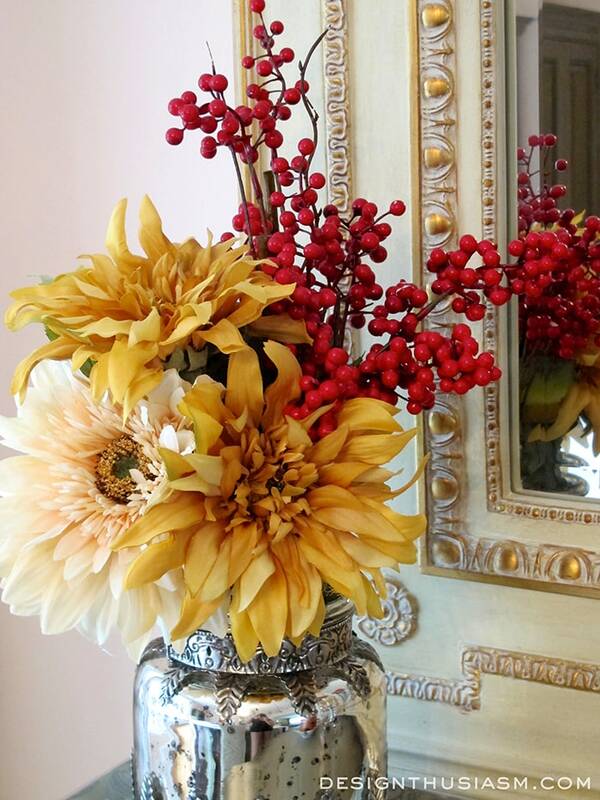 On the sideboard this floral arrangement picks up the berry red and golden feel from the table. The silk flowers are from Pottery Barn, as is the mercury glass vase. The cream and gilded trumeau mirror is from Ethan Allen. 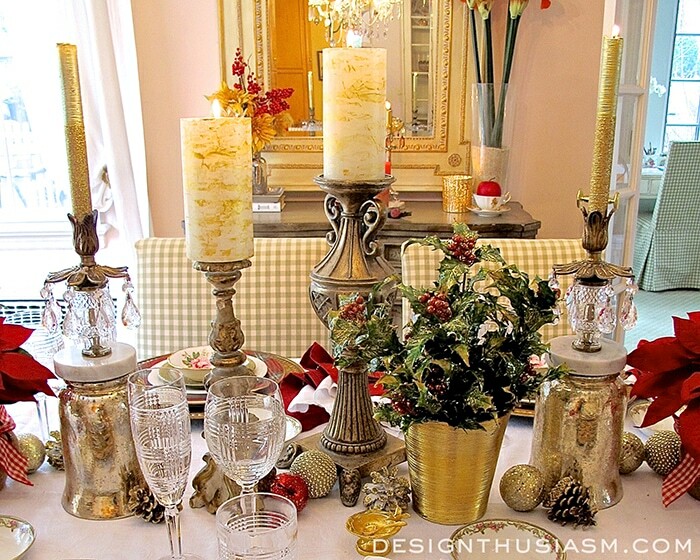 Other holiday elements adding cheer to this table are the burlap wrapped poinsettias and various gilded candlesticks. The glen plaid Ralph Lauren stemware makes an appearance on many of my tables, but nowhere does is work so well as when mixed with the tartans here. For height I lifted the crystal candlestick holders onto inverted mercury glass vases. 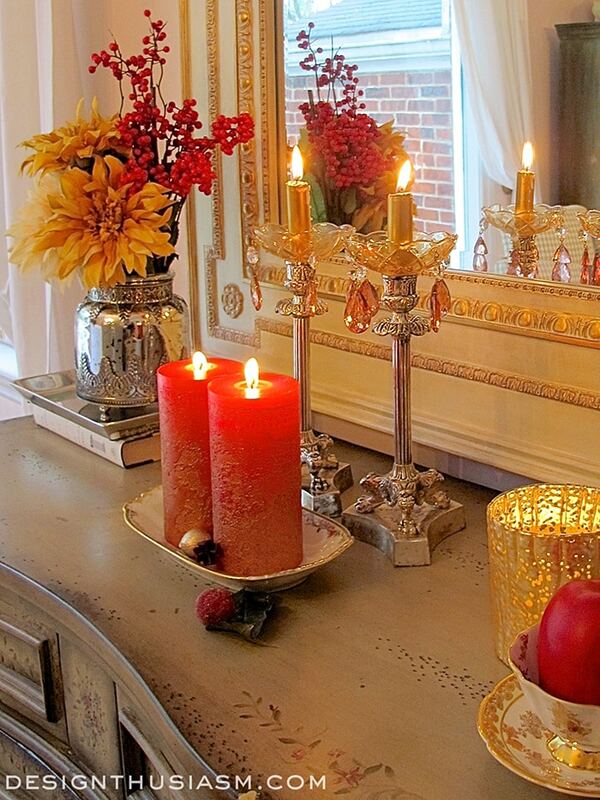 I love to use multi-tiered levels in my table centerpieces, especially when it comes to candlelight sources. For a celebratory meal of this sort the warm glow of candlelight is spread throughout the room. Although this tablescape utilizes many elements, the result is a cohesive setting that honors the joyous season and welcomes the family that will celebrate here. Linking with Inspiration Monday, YourDesignsThisTime, BNOTP, Inspire Me Monday, Dwellings Amaze me Monday, Inspire Me Tuesday, Coastal Charm Tuesday, The Scoop, Twirl and Take a Bow, Wow Us Wednesdays, Home and Garden Thursday, Jan Olson Thursday, Beyond The Picket Fence Vintage, From My Front Porch to Yours, Feathered Nest Friday, Show and Tell Friday, Shabby Nest Frugal Friday, Funky Junk Interiors, Best of the Weekend Party, Thoughts from Alice Sundays, Silver Pennies Sundays. Beautifuk table, Lory! 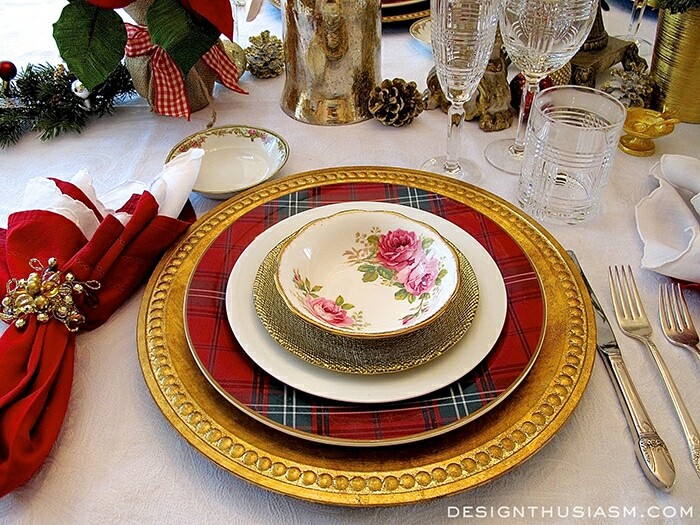 I bought the WS tartan plates for our dining table, as well. Love that you mixed in the RL Glen Plaid stemware. The compliment each other beautifully! Merry Christmas to you and your family! Beautifully elegant, Lory. Loving all the gold and red. The tartan plates are fab with the vintage roses. Nice crystal, too. Thanks so much, Marigene! Same to you!! So Pretty! 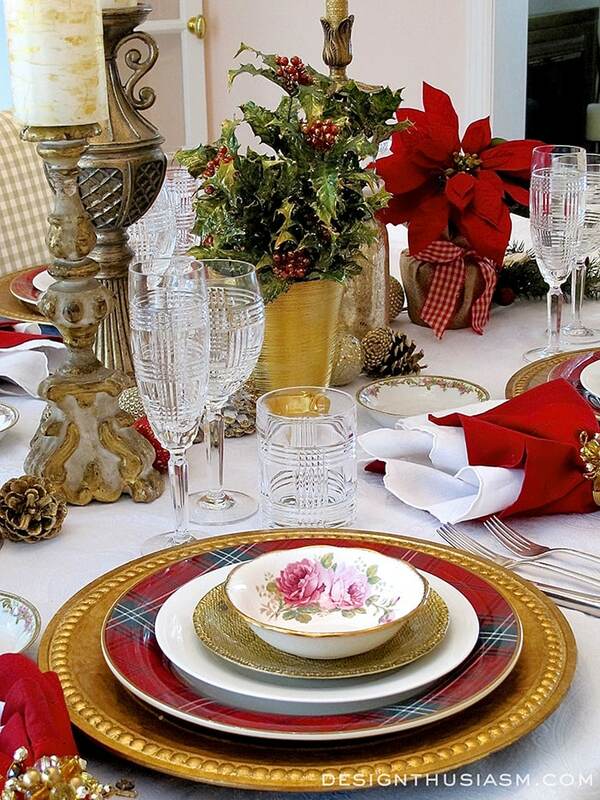 I love the combination of the plaid with the delicate rose dishes! I have the Pottery Barn plaid dishes and I wish I had more! Thanks, Cindy! I actually really wanted the Ralph Lauren plaid, but couldn’t find them in store and it was too late to order… 😉 Thanks for visiting!! Lovely table! Gorgeous combination of tartan and softness of floral….very pretty! Visiting you from the scoop. Thanks so much!! I was delighted for the feature because I met some lovely new “faces”… 🙂 Thanks for stopping by! 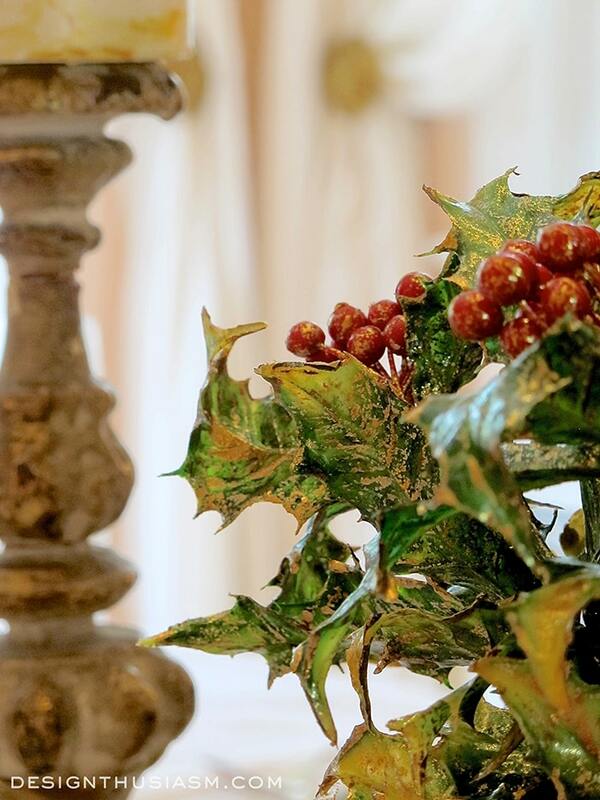 A very elegant and festive table. I love all the attention to detail. The added touch of roses is brilliant. Hi Lory! What a lovely table setting. I love your addition of the table ‘jewelry’. What a great way to phrase it. I also love the glen plaid stemware from Ralph Lauren. It does go perfectly with the tartan. 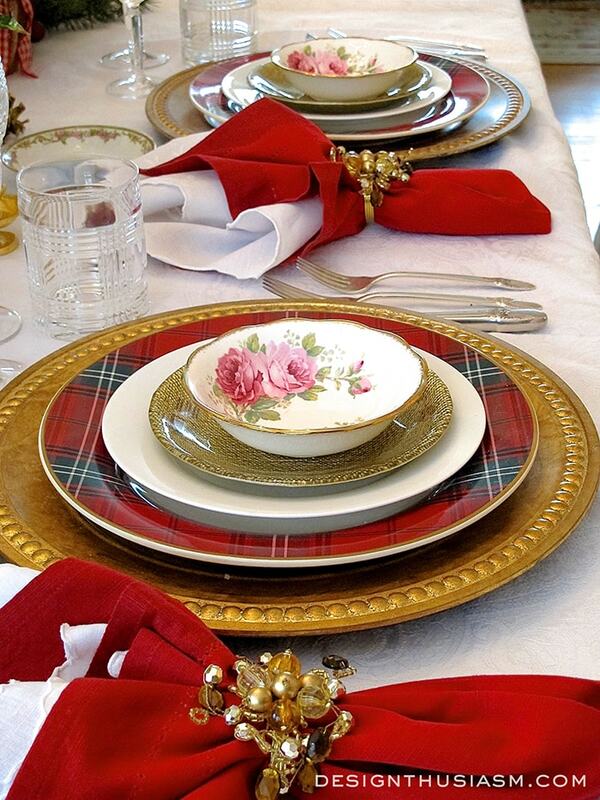 I am loving the look of tartan and it looks fabulous on this table setting. Thank you for the inspiration! Thanks so much, Thea!! Yes, the jewelry thing is left over from my sportswear design days. When we did denims, we used to refer to the buttons and other trim as the jewelry… 😉 Have a wonderful Christmas!! Love the combination of plaid and floral! Everything is just beautiful! I used the new Lenox plaid dishes this year. Love plaid! Thanks so much! I’m currently working on one for this year… 😉 Stay tuned! !